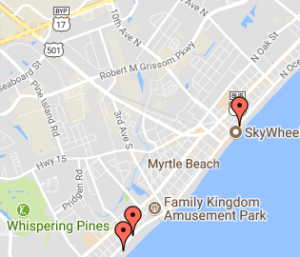 With two locations in the Myrtle Beach area, you really don’t have a reason not to try this local favorite. Don’t let the humble interior fool you – the food here is easily the best among any cuisine you’ll find in the area. Their BBQ plates include options like a half or whole rack of their fall-off-the-bone tender baby back ribs, grilled chicken, chopped pork or chicken, sandwiches, and combo plates in case you can’t decide on just one. BBQ wouldn’t be complete without home-style sides and Little Pigs comes through with flying colors. Choose between an array of favorites like mac ‘n cheese, potato salad, slaw, hush puppies, and even a deep fried corn on the cob. Call (843) 692-9774 for the location nearest you. New to the area, this quaint eatery is quickly becoming a favorite among locals and visitors alike. This restaurant features a shabby chic “barn” feel inside to complete the country style buffet, served fresh daily. Don’t let the idea of a buffet scare you away, the meats here are smoked in house and the sauces and sides are made in house as well. Enjoy grilled chicken, pulled pork, ribs, and even a few low country staples like chicken bog and peach cobbler, in addition to savory sides like sweet potato casserole and campfire baked beans. Open daily for lunch and dinner, this restaurant even features a drive through, making it easy to get BBQ to-go. Call (843) 839-1913 for more information. If you are seeking the absolute best ribs in town then look no farther than Bid Daddy’s Roadhouse Grill. Their loyal following can attest to the fact that their house smoked ribs are quite literally fall off the bone tender and the melt in your mouth sauce is just the icing on the cake. If you are in the mood for something different, try the Southwestern BBQ Chicken which is smothered in the house BBQ sauce then topped with cheddar jack cheese, crispy bacon, and onion straws and then baked to perfection. Big Daddy’s is the perfect place to take a group who can’t decide as they offer plenty of other selections in addition to their famous BBQ. Call (843) 234-3287 for more information. Another new buck in town, Dickey’s BBQ Pit offers a slight change of pace. Though they are technically a chain, don’t let that scare you away. They have perfected the art of BBQ and offer fast, friendly service and a spacious, up kept dining room that is ideal for families and groups. Their menu offers several options that many BBQ places don’t, like beef brisket, BBQ honey ham, smoked turkey breast, and even Polish sausage, in addition to traditional favorites like grilled chicken, ribs, and pulled pork. The side items are just as diverse as the meat selection and include options like waffle fries, fried okra, baked potato casserole, fried onion rings, and even a Caesar salad. Dickey’s also offers a few “family pack” options, ideal for feeding hungry groups. Call (843) 839-0209 for more information. This award winning eatery is a favorite not only because of the succulent cuisine but also because of the breathtaking oceanfront views! The menu here offers plenty of options and is sure to cater to even the pickiest palette. The lunch menu offers a popular “meat and three” option, in addition to several sandwiches and salads while the dinner menu offers any BBQ creation you could imagine. Try the one of the famous rib combos, like the ribs and shrimp, or the southern pulled pork sandwich. “Secret’s in the sauce” – or so I’ve heard – and theirs does not disappoint! But don’t worry – the non-BBQ crowd will have plenty of other succulent options to dig in to as well. Call (843) 626-8000 for more information.